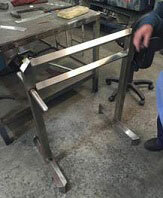 Local Sheetmetal & Engineering Support Services for "Business Expansion"
Are you from interstate or overseas looking for fabrication and engineering support around the Sydney Region, New South Wales, Australia? Acquiring immediate local knowledge, experience and resources can be challenging when you try to expand or do business into another state (NSW in this case), in Australia, or another country. It can be a long process finding buildings, staff, equipment and knowledge that takes years to acquire, all associated with a large amount of expense. Nowadays, comprehensive manufacturing facilities in the Sydney area are becoming scarce, and sourcing products and materials is getting difficult. This is due to the reduction of many manufacturing businesses over the last decade. So what is a good option for your business expansion? Machines need to be designed, manufactured and fitted properly, while installations often need extra supporting infrastructure. Having the local knowledge and labour to source those missing or extra parts is our great advantage. 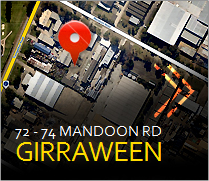 For over 50 years, C-Mac has been the local manufacturer of high quality engineering products in Western Sydney. With our capability and exceptional workmanship, your engineering and fabrication projects can be completed locally in short lead times. Apart from serving local businesses, we also provide “Innovative Metal Solutions” to the companies coming from interstate and overseas. For overseas organizations, C-Mac can become your local sales agent in Australia or can manufacture your product components locally to suit "Australian Standard"s and "Fairworks Australia" working conditions. What are the benefits of partnering up with C-Mac Industries? Partnering up with C-Mac, provides you with comprehensive manufacturing facilities and expertise to support the installation of equipment under your supervision and instruction. C-Mac manufactures a wide range of equipment in-house to cover all your engineering and fabrication needs. Spare parts support and maintenance for your machines can also be provided. Dupont (USA) – Professional engineering design labour provided over a 3-month period. New plant (second hand) from the USA installed over a 6-month project along with supply of connecting auxillary equipment and repairs of damaged parts. 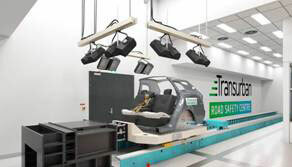 Escribano (Italy) – Installing crash test unit for Neuroscience Research Australia (Randwick NSW). C-Mac to Install & Commission. Instigate ongoing maintenance support program into the future and provide spare parts as needed. RM Srl Unipersonale – Seven seas Navigator, an Italian cruise liner required parts when docked in Sydney – C-Mac Industries was contracted to supply material with test certification in a very short lead time. European Meat Processing Company installed their equipment into a local processing plant. C-Mac supplied a full-time sheet metal worker for 3 months on the site to measure up, return to the factory to fabricate, then installing walkovers, guarding, platforms and fabricated stainless steel items for the meat processing plant while it was being installed. Ongoing supportive engineering and fabrication work in stainless steel is also being provided.